Christine Lovly, M.D., Ph.D., assistant professor of Medicine and Cancer Biology, has been awarded a V Scholar Grant from the V Foundation for Cancer Research. The award, funded by The Hearst Foundation, will provide $200,000 over two years for the study of a novel gene mutation linked to some forms of cancer. The V Scholar Grants are designed to help early career scientists with their research efforts. 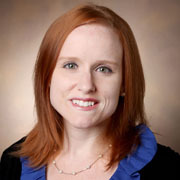 Lovly and colleagues in her research laboratory at Vanderbilt-Ingram Cancer Center (VICC) recently detected a novel mutation in the EGFR gene in the tumor of a young lung cancer patient. The mutation, which they named EGFR-KDD (for kinase domain duplication) had not been described previously in lung cancer. “The grant from the V Foundation will enable us to further study this rearrangement of DNA within the EGFR gene and determine how this putative oncogene is driving the growth of cancer, as well as therapeutic options for patients whose tumors harbor this mutation,” Lovly said. Based on research spearheaded by Lovly’s lab, investigators at Vanderbilt University Medical Center (VUMC) determined that a specific anti-EGFR drug is most likely to be helpful against tumors with the EGFR-KDD mutation. Following publication of their work, other lung cancer patients with this mutation have also been identified. The V Foundation for Cancer Research was founded in 1993 by television sports network ESPN and Jim Valvano, a sports commentator and former North Carolina State University basketball coach. Valvano, who led his team to an NCAA championship, was diagnosed with cancer of unknown primary origin at the age of 46. Prior to his death in 1993, he collaborated with ESPN executives to establish a nonprofit foundation for cancer research and programs for patients and families. To date, the foundation has donated more than $150 million to 120 facilities in support of these programs.